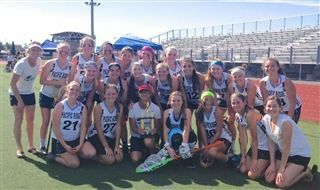 Congratulations to the Girls Varsity Lacrosse team on its second-place finish at the 11th annual Surf Sun & Stix Tournament at Westview High School. The girls battled through 90 degree temperatures and three tough competitors to win their bracket before eventually falling to Patrick Henry 4-6 in a hard-fought final game. Coach Neptune and Coach Enge were extremely impressed with the team's effort. "The defense played exceptionally well, reading opponents effectively and stopping goals," said Coach Neptune. "The attack was patient with scoring and making its presence felt behind the goal, and our goalies were super at stopping balls at critical moments."